This story really shouldn't be any surprise, but we get the feeling some out there may try to blow it up into something that it's not. In our estimation, Asus made a comment that was wholly accurate, and based on reality, but even the original source for the comment has made too much of it. Here's what Asus Corporate VP Benson Lin told TechRadar: "Asus is very close to Google, so once they have Android 5.0 I think there will be a high possibility that we will be the first wave to offer the Jelly Bean update." And, here's the headline that TechRadar put on the article: "Android Jelly Bean could come first from Asus." Does everyone see the disconnect here? Lin told the truth: Asus is close to Google, and it will likely be in the first wave to offer the Jelly Bean update. You know, just like Asus was the first to offer the Ice Cream Sandwich update after that was released. And, why is Asus able to make this statement truthfully? Because, Asus does two important things: 1) Asus doesn't put a heavy skin on Android, and 2) Asus doesn't lock its tablets to a carrier. This means that there is little work to be done to get Android working on Asus devices, and no carrier approval to wait on, which are the two biggest roadblocks to Android updates. So, yes, Asus will likely be in the first wave to offer the Jelly Bean update, and could even be the first 3rd party manufacturer to offer the update after whatever Nexus device launches Android 5.0. But, that's exactly what we should expect from a company that knows the fastest route to Android updates. once i experiance ICS i will look forward to 5.0 "jellybean"
I have been to the land of sugar and honey, and it is AWESOME! Asus is a great company. I have several phones and several tablets and can honestly say that Asus makes a great product. I bought the original asus transformer with the dock and also have the samsung galaxy tab 10.1 4g and after the ICS ...the transforner is still my favorite tablet. It is blazing fast and has improved with the ICS update. Way faster than my tab ....i also had the ipad and HTC jetstream and the asus is still better in my books. Buid quality was a bit lacking however the new one solved that issue. I only hope Asus will update the transformer to 5.0 as well.. Spec wise it should have enough power to run it so i hope they do. I'm an Eee Pad Transformer owner as well. I really appreciate Asus getting their update out so quickly. I was quite surprised it came out so soon. It's interesting how the article mentions that their tablets are not locked to carriers. I don't know how carriers can lock tablets that only have a WiFi version. Perhaps Asus should approach Google about making the next Nexus phone if they are supposedly so close to Google. Of all the manufacturers that make Android devices. Asus seems to try to be the most innovative with their hardware. That is the reason I got an Asus tablet over anything else. 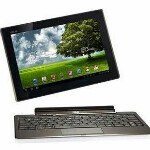 The keyboard dock is what makes them stand out above all other tablet makers. Not trying to say they should stop moving foward, but didn't ICS JUST come out? you know how it goes. just on to the next one.